WHEN are Barcelona going to realise that they cannot simply buy any player they want – simply based on their reputation, heritage…and dosh? It has been suggested this morning that the Spanish giants are ready to up their bid for Liverpool play-maker Philippe Coutinho. Barca have already put in two bids – the latest being £90million – despite being told on numerous occasions ‘Coutinho is not for sale’. So why don’t they just back off? Jurgen Klopp is standing firm. 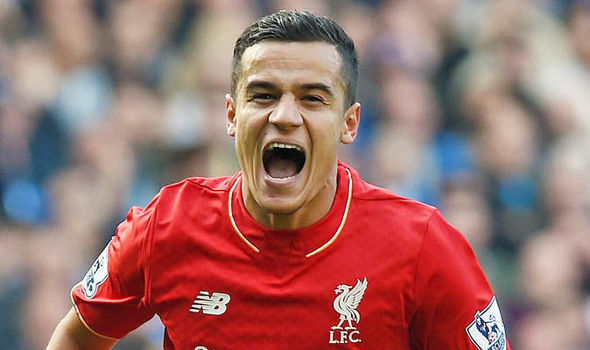 Of course, having sold Neymar to Paris Saint Germain for an outrageous £200million, Barca could easily come back with an equally ridiculous offer for Coutinho. I hope Liverpool do not cave in and some sort of sanity is restored to our game. I’m sure Coutinho will go to Spain at some point and it may happen next summer if Liverpool, even with Klopp re-building such strong foundations, fail to deliver the goods. The 25-year-old Coutinho, who joined Liverpool from Inter Milan for £8.5million in 2013, obviously wants to win trophies. What player with his immense ability wouldn’t? Can he reach his goals with Liverpool? That remains to be seen. But under Klopp, who has had time to settle, assess and address, they have their best chance for years. And they need their latest talisman to lead the way. Despite missing ten games last season with an ankle injury, the brilliant Brazilian still managed to score 14 goals – and provide a number of assists. He is key to the way Klopp wants his side to play. Where is he going to find anyone better in Coutinho’s ‘number ten’ position? It’s also worth reiterating that the Samba star only signed a five-year deal in January – without a release clause included. So I repeat in my Liverpool rant – BACK OFF BARCA!